Kim Jong Un, first secretary of the WPK, chairman of its Central Military Commission, first chairman of the National Defence Commission of the DPRK and supreme commander of the Korean People's Army (KPA). Present at the meeting were members of the WPK Central Military Commission, executive members of the KPA Party Committee, senior officials of the General Political Bureau, the Ministry of the People's Armed Forces, departments and sections of the General Staff of the KPA, commanding officers of all the services and corps-level units, military academies at all levels, senior officials of the organs of state security and people's security, the WPK Central Committee, Cabinet and the field of foreign affairs and chief secretaries of the Provincial Party Committees. The meeting analyzed and reviewed the revolutionary measures taken by the WPK and the DPRK government under the most dangerous situation which reached the brink of war, successes, experience and lessons drawn from the course of implementing them. On the basis of them, it discussed important strategic tasks to bolster up the national defence capability as firm as iron wall. The meeting also discussed measures for recovering from the flooding which hit Rason City and dismissed some members of the WPK Central Military Commission and appointed new ones and dealt with an organizational matter. Informing its participants of details of the recent crisis, Kim Jong Un analyzed and reviewed the preparations for military operations made by the frontline units which had been in the state of war and the work done in various fields in the areas where the semi-war state had been declared and how the north-south high-level urgent contact was made and appreciated them. He said that under the touch-and-go situation the WPK displayed its correct leadership art by steering the whole country, all the people and the service personnel and made resolute decisions and set forth strategic policies for putting the difficult situation under control. All the people turned out as human bullets and bombs to defend the revolution and the front and rear and the service personnel and people single-mindedly came out in the courageous actions to protect the country, he said, adding that the might of the whole state and all-people unity was something unprecedented. We protected the dignity and sovereignty of the country, the gains of the revolution and the happiness of the people by our own efforts amid the tempest of the history without anybody's support and sympathy, he noted. He said that this time the DPRK proposed the north-south high-level urgent contact on its own initiative and put under control the situation which inched close to an armed conflict, thereby clearing the dark clouds of war that hung over the Korean nation and defended peace and stability on the Korean peninsula and in the region. The joint press release published at the contact provided a crucial landmark occasion of defusing the acute military tension and putting the catastrophic inter-Korean relations on the track of reconciliation and trust. He said that the DPRK's sovereignty and fundamental interests can never be bartered for anything and dialogue and peaceful climate contrary to them are meaningless. 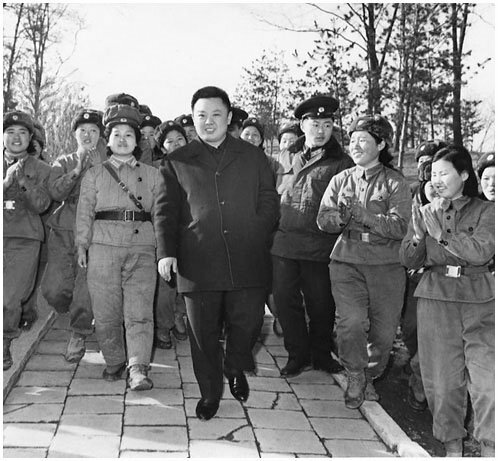 Noting that peace restored under the situation that reached the brink of a war was by no means something achieved on the negotiating table but thanks to the tremendous military muscle with the nuclear deterrent for self-defence built by the great party as a pivot and matchless ranks single-mindedly united around the party, he emphasized that the armed forces of Songun and the single-minded unity that have grown stronger amid the tempest of the times always serve as an essential guarantee for defending peace on the peninsula. Underscoring once again the need to channel top priority efforts into bolstering up the military capability for national defence, he specified strategic tasks and ways for doing so. As was already reported, the north and the south held a high-level urgent contact at Panmunjom from August 22 to 24 and had a wide-ranging discussion on various issues of putting under control the recently created grave situation and improving the north-south relations and made public a joint press release on the basis of its results. The joint press release reflected the will and stand of both sides to prevent armed conflicts, de-escalate tensions and promote the development of the bilateral relations. It was very fortunate that the recent contact helped defuse the danger of the touch-and-go situation that may plunge not only the Korean peninsula but the whole of Northeast Asia into the whirlpool of an upheaval and offered an opportunity of a dramatic turn in achieving peace, stability, reconciliation and cooperation between the north and the south. We are pleased over the fact that the north and the south sat face to face, sympathized with the danger of the situation and had an exhaustive discussion to reach an agreement on issues of common concern, thus opening up an epochal phase for turning misfortune into blessings in the north-south relations. The public at home and abroad are unanimously welcoming the north and the south for preventing the situation from plunging into an unpredictable conflict and joining hands for reconciliation. The north and the south should value the spirit of the agreement reached at the contact and not just feel complacent at tiding over the extreme crisis but advance the north-south relations in the constructive direction for reunification. It is my view that the contact would not have considerable meaning if it just ends up as a stop-gap measure. Both sides should wipe out mistrust and confrontation and opt for mending the bilateral relations from a bold stand through dialogue and negotiations. As was agreed in the joint press release, the north and the south should resolve issues of common concern through dialogue and negotiations between the authorities and reenergize broad exchanges and cooperation in various fields. To this end, it is of priority importance to keep afloat and develop the present trend of situation in which the north and the south put on the track of detente with much effort. The north and the south should never allow such happening which makes them get inveigled in a disturbing situation for uncertain reasons, leading the situation to an extreme phase. In fact, the north and the south should not have been embroiled in such abnormal case as the recent one. Both sides should learn a lesson from the recent case, should not lose reason and temper when complicated problems arise in the inter-Korean relations but make efforts to prevent the recurrence of such incident. The north and the south should no longer be bound to the past but care about the future of the nation first and look far into the future and join hands for repairing the relations and achieving reunification. There can be forces unwilling for the rapid development of the north-south relations. So, we should be vigilant against them. From this viewpoint, the north and the south should pay particular attention to preventing any unexpected incident from happening and firmly maintain the idea of By Our Nation Itself. Consistent is the stand of the DPRK to bring about a great change and surge in the north-south relations and open up a wide avenue to independent reunification this significant year of the 70th anniversary of Korea's liberation. Greetings to All Songun Idea Followers on the Day of Songun ! Greetings to all Songun Idea followers on August 25th Day of Songun ! Today is the 55th anniversary of the start of the Songun revolutionary leadership . The Songun revolutionary leadership of the great leader comrade KIM JONG IL which began on the 25th of August 1960 when the confrontation with US and world imperialism was most intense and the modern revisionists were putting pressure on the DPRK to give up the revolutionary road . 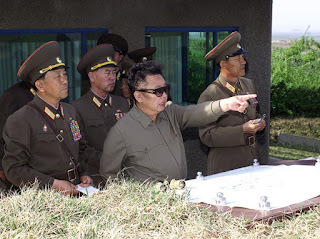 By visiting the Seoul Ryu Kyong no 105 Tank Division of the Korea People's army chairman KIM JONG IL continued the cause of Songun pioneered by the great leader President KIM IL SUNG and heralded the start of the Songun revolution . The decades that followed were decades of victory and glory in which the powerful armed forces of Juche under the Songun revolutionary leadership dealt many blows against the US imperialist such as the Pueblo incident and the Panmunjom incident. Thanks to the successful Songun revolutionary leadership the DPRK is now a socialist nuclear power and a satellite launcher and one of a dozen countries with SLBM capability. The DPRK stands out as the militant anti-imperialist bastion and fortress of world socialism. Songun politics is the cutting edge of anti-imperialist independent ideology that inspires the world revolutionary people.The Songun revolutionary leadership also powerfully inspired the south Korean people in their revolutionary struggles . Today the Songun revolutionary leadership is continued by the dear respected leader Marshal KIM JONG UN! It is now some three years since this highly significant speech was . It was a profound manifestation of the will of the dear respected Marshal Kim Jong Un to reunify Korea. In the speech the dear respected leader Marshal Kim Jong Un praised the Songun revolutionary leadership of the great leader comrade Kim Jong Il which had started on August 25th at the Seoul Ryu Kyong Su no 105 tank division of the KPA. He said that August 25th is as important as April 25th the day of the foundation of the KPA. These speech was made not in Pyongyang but in a frontline area the eastern sector of the front. Dear respected Marshal Kim Jong Un is not an armchair general but a man of action and great commander who visits frontline areas regardless of the safety of his own life. He visited many front-line units in the face of the enemy sometimes twice or three times. He gave the order for the KPA to mount a decisive retaliatory strike should even a shell fall on the territory of the DPRK and that the KPA should lead a war for national reunification. counter a provocation with a prompt counterattack and a war of aggression with a great, just war for national reunification!' This is our principled stand and steadfast will. We will not remain an onlooker to the enemies' frantic moves for aggression but make every possible effort to protect the destiny of the country and the nation. It is the truth proved by history that no force on earth can overpower the people who are all out for the cause of justice. If another war breaks out on this land due to the U.S. and the south Korean puppet forces' intolerable actions, though we do not want it, the war will only bring a shameless doom to them and our great nation will greet a new bright day of national reunification." Thus dear respected Marshal Kim Jong Un clarified the will of the KPA and Korean people to reunify Korea if the US imperialists and south Korean puppets dare to attack the DPRK. If such a war broke it would become a sacred national reunification war , a war of liberation. 69 years of cruel national division would be over and the south Korean people liberated from the oppression and exploitation of US imperialism . It would be final victory in the anti-US showdown. As the US imperialists increase their anti-DPRK moves each day and the showdown with the US deepens it becomes even more important to study this work . It is a powerful militant , revolutionary and anti-imperialist speech that inspires us Juche idea and Songun idea followers of the UK ! The Association for the Study of Songun Politics UK and the Juche Idea Study Group of England issued the following joint statement on the 2nd anniversary of the publication of the work "Let Us Add Eternal Brilliance to comrade Kim Jong Il's Idea and the Achievements of the Songun Revolution " by dear respected Marshal Kim Jong Un. This work, which takes the form of a talk given to the daily press organs of the Workers' Party of Korea and the Korean People's Army , very clearly analyses and sums up the achievements of the Songun revolution under the leadership of the great leader generalissimo Kim Jong Il and charts the way forward along the road of Songun, independence and socialism . The work was published on the occasion of the Day of Songun , the 53rd anniversary of the start of the Songun revolutionary leadership of the great leader generalissimo Kim Jong Il which began with the guidance given to the historic Seoul Guards Ryu Kyong Su no 105th Tank division of the Korean People's Army. This anniversary is not only acclaimed by the Korean people but by Songun idea followers throughout the whole world. In the work dear respected Marshal Kim Jong Un praises the exploits of the great generalissimo's Kim Il Sung and Kim Jong Il in creating a new history of Songun and ushering in the era of Songun , he also clarifies the essence and originality of Songun , explains the history of the Songun revolutionary leadership of the great leader comrade Kim Jong Il and calls for putting into effect the instructions of the great leader comrade Kim Jong Il. Dear respected Marshal Kim Jong Un in the work points out the Songun idea is an revolutionary idea embodying the anti.imperialist stand. This sums up the Songun Idea in a nutshell and shows why it should not only be studied by the Korean people but the revolutionary people's of the world in order to guide them in their anti-imperialist struggle for independence. Songun is intimately bound up with the anti-US,anti imperialist struggle as dear respected Marshal Kim Jong Un says "Regarding the strengthening of the KPA as the most important of affairs in the Songun revolution, he raised the KPA as the buttress, the main force, of our revolution and achieved the historic victory in the grim anti-imperialist, anti-US showdown in defence of the country's security and socialism by training the KPA to be the army of the leader boundlessly faithful to the cause of the WPK (Workers' Party of Korea), to be an invincible revolutionary army"
" As an idea enriched and developed in the course of the practical struggle to apply the Juche idea, the Songun idea is a scientific revolutionary theory which makes it possible to satisfy the requirements of the Juche idea in a perfect and comprehensive way. The formulation and development of the idea and theory of the Songun revolution by the great Comrade Kim Jong Il further enriched the ideological and theoretical treasure-house of our revolution and greatly increased the appeal and vitality of the Juche idea. The Juche idea is the roots of the Songun idea and the latter is a brilliant embodiment of the former. Thanks to the Songun idea, the Juche idea could be splendidly applied to the revolutionary practice, shining more brightly as a great guiding ideology which guarantees the victorious advance and accomplishment of the masses' cause of independence." This is a brilliant exposition of the dialectical correlation between the Juche Idea and Songun idea which we find greatly inspiring.
" In order for the masses to carve out their destiny and accomplish the cause of socialism amid sharp confrontation with the imperialists and constant danger of war, they must, before anything else, firmly hold up and strengthen the arms of the revolution. It is a serious lesson taught by the history of the world socialist movement that when the arms of the revolution are weak or waver, they can defend neither the destiny of the masses nor socialism"
Dear respected Marshal Kim Jong Un's work "Let Us Add Eternal Brilliance to comrade Kim Jong Il's Idea and the Achievements of the Songun Revolution is an excellent summation of the history of the Songun revolutionary and at the same time a militant declaration that the DPRK will adhere to the idea of Songun forever and never step back from the road that it has chosen . It is more than that , it is a guideline and programme for advancing along the road of the Songun revolutionary leadership in the future. On the occasion of the 2nd anniversary of its publication we have no hesitation in commending this work to our members and Songun idea followers of the world. A must read for those who wish to study Songun. 55 years ago, Chairman Kim Jong Il inspected the Seoul Ryu Gyong Su Guards 105th Tank Division of the Korean People’s Army on August 25, 1960 and his visit was a historic event that proclaimed his succession of the cause of the Songun revolution and the start of his Songun-based leadership. Since then the sacred history and tradition of the Songun revolution pioneered and advanced on Mt. Paektu on the strength of arms, has been succeeded successfully and the historic turn has been brought about in building up the KPA and accomplishing the revolutionary cause of Juche. Songun was Chairman Kim Jong Il’s revolutionary idea, his practice in the revolution, his political ideal and his political mode. He won the victory in the grim anti-imperialist, anti-US showdown in order to defend the Juche socialism. And the history of his Songun revolutionary leadership is shining as the sacred history. He raised the KPA as the buttress, the main force of the revolution in the face of myriad of difficulties and firmly safeguarded socialist Korea founded by President Kim Il Sung by wisely leading the DPRK Army and people. The history of his Songun revolutionary leadership is shinning as immortal annals during which he laid solid cornerstone for national prosperity and the accomplishment of the Juche revolutionary cause. In the flames of great upsurge in the revolution, the dynamic campaign are being waged to push back the frontiers of science and technology and for the industrial revolution in the new century. The monumental edifices symbolizing the Songun era have been built throughout the country. With his prominent Songun revolutionary leadership, he frustrated the anti-reunification confrontational scheme of the separatists at home and abroad to open up the June 15 era advanced by the united efforts of the Korean nation. He secured the peace in Asia and the world and made great contributions to the realization of the cause of independence for humankind. His whole life dedicated to Songun was a brilliant career of peerless patriot and outstanding revolutionary only for the country and revolution. Now the justness and vitality of Songun politics are displayed to the full. The world revolutionary people, who are aspiring after independence against imperialism, positively support Songun politics and highly praise the exploits of the Chairman. Saying that the destiny of the nation and the future of reunification depend on the Songun politics, the south Korean people are lost in admiration for it. The Internet websites introducing Songun politics are on the increase in south Korea and the articles admiring it such as “Source of power to protect the sovereignty of the nation is Songun politics.”, “Songun politics, the guarantee for peace on the Korean Peninsula deters the provocation of the US nuclear war”, “Songun politics and destiny of the nation” are posted on the websites. Noting that they lead the peaceful life thanks to the Songun politics, the south Koreans are appreciating it safeguarding the nation and opening up the way to reunification and prosperity. 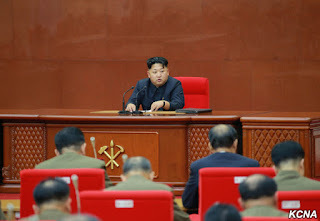 Now the cause of Songun revolution is succeeded vigorously by the supreme leader Kim Jong Un. Under his wise leadership, the idea and exploits of Songun revolutionary of Chairman Kim Jong Il will go down along with the new century of the Juche era. The 55 years of Songun revolutionary leadership that started on the 25th of August 1960 have been 55 years of victory and glory . The Songun revolutionary leadership that was started by the great leader comrade KIM JONG IL is today continued and carried to new heights by the dear respected leader Marshal KIM JONG UN. The Songun revolutionary leadership began in the heady days of the struggle against US imperialism and modern revisionism. In the days of the early 1960s the US imperialists were increasing their pressure on the Democratic People's Republic of Korea , the bastion of socialism and independence . The US imperialists shipped nuclear weapons and missiles into Korea. Allied to the US imperialists , were the modern revisionists who wanted to force Korea to give up its independence and compromise with and capitulate to US imperialism just like they were doing. "The Day of Songun, when General Kim Jong Il started his leadership of the Songun revolution, is, together with the day of the founding of the KPA (Korean People's Army), a historic day when an important milestone was set up for the history of building up our revolutionary armed forces and the history of our country. As there was this significant day, a historic turn could be brought about in developing our revolutionary armed forces and implementing the cause of the Juche revolution, and the history and traditions of our sacred Songun revolution that had been pioneered and developed by force of arms, achieving victory, could be carried forward continuously. Songun is a proud tradition of the Korean revolution which was pioneered by Comrade Kim Il Sung and led by him and Comrade Kim Jong Il and the banner of victory and glory." Under the Songun based revolutionary leadership of leader KIM JONG IL the KPA and Korean people smited US imperialism with full force.In January 1968 the USS Pueblo an armed spy pirate ship of the US imperialist aggressors was captured by the KPA navy off Wonsan(the Pueblo can be seen today on the bank of the river Taedong).The US imperialists demanded the immediate return the ship falsely claiming that it was in “international waters” and the cowardly revisionists tried to advise the DPRK to send the ship and its crew back. "Nowadays people of a certain country are saying that if a war breaks out in Korea it will be serious problem,and “advising us” it would be better to have the Pueblo quietly released.This would mean making a concession to US imperialism,and we can never do such a thing.A concession to US imperialism means submission and surrender.Since the our People’s Arm“Ny did not capture the “Pueblo” on the sea off the United States,but when it was in violation of our country’s territorial waters and engaged in in acts of espionage,we need to neither make any concession to the Americans or pander to them”The DPRK resolutely stood firm and refused to do so until an apology from the US was issued .In 1969 the US imperialist spy plane EC121 tried to infiltrate into DPRK but was shot down by the KPA airforce.In 1994 a US army helicopter infiltrated into DPRK airspace and was brought down by one shot by the KPA. The US imperialists seeked to isolate and stifle the DPRK by inventing the nuclear issue on the Korean peninsula leading to the 1st ‘Korean nuclear crisis’ in the 1990s and the 2nd one in the 2000s.The DPRK refused to bow down and instead declared a semi war state and announced its intention to withdraw from the one sided and iniquitous NPT in 1993. This move stunned the US and they had to enter into talks. When Bush vociferated about a “rogue state” and “axis of evil” and raked up the 2nd nuclear crisis the DPRK under the Songun supreme commander comrade KIM JONG IL responded with a series of hardline measures namely withdrawing completely from the NPT and declaring itself a nuclear state.This was not mere words,the DPRK successfully carried out nuclear tests in October 2006 and May 2009. The nuclear device was the fruit of self reliance based 100% on Korean resources and technology. Thus under the Songun revolutionary leadership the DPRK has been fortified ever more strongly as powerful socialist state of independence.A country of Juche which is able to do what it likes and say what it like no matter what others may say or think.Comrade KIM JONG IL brilliant commander of Songun declared on the 1st of January 1995,at the Takasbol army post that the Korean people had a choice of either being an independent people adhering to socialism or colonial slaves of imperialism. Today the Songun revolutionary leadership is carried forward by the dear respected leader Marshal KIM JONG UN who said " Counter provocations with an immediate counteroffensive, and an aggressive war with a war of justice for the country’s reunification–this is our principled stand and unshakable will. Dear respected Marshal KIM JONG UN has upheld the Songun revolutionary anti-imperialist idea and placed considerable emphasis on anti-imperialist class education including the rebuilding of the Sinchon museum. The Songun revolutionary leadership started by the great leader eternal chairman KIM JONG IL and carried forward by dear respected Marshal KIM JONG UN will be ever-victorious !